If you are serving a large audience, say 1000, will the adobe connect server have to deal with the bandwidth requirements of the 1000 videos that need to be served up? Or does each video get served to the users computer? 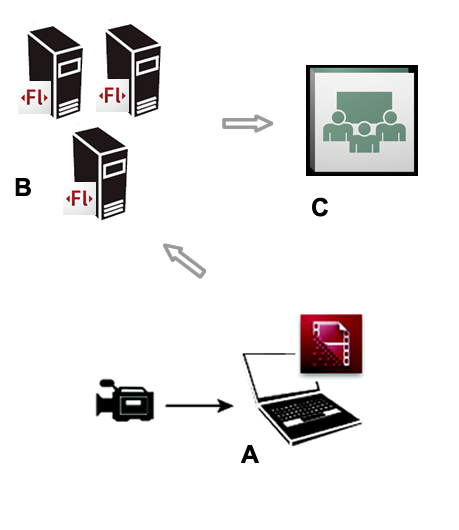 What i’m trying to say is, is the Adobe Connect server a bottle neck of sorts for large quantities of video? There are several ways to deploy Adobe Connect. First you can install it in your own datacenter, you could also use the Adobe hosted option or go with managed services (Adobe runs it but it is not shared. It is dedicated). If you go with either hosted or managed services you do not pay for bandwidth. If you run the server then you do. The amount of bandwidth required depends on what you are doing with the server. If you intend to serve presentations that were converted from powerpoint the bandwidth requirement is very low. If you add screensharing and a bunch of webcams that will add to the bandwidth requirements. Very great post. I simply stumbled upon your weblog and wished to mention that I have truly enjoyed surfing around your weblog posts. In any case I’ll be subscribing to your feed and I am hoping you write again very soon! I just tried out the custom pod with amazon cloudfront and it all worked really well. Very nice and crispy video. 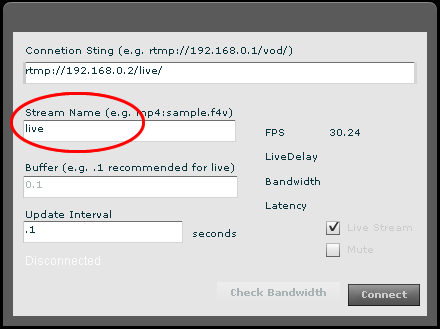 But the video will always have the same size as the one I specified in flash live encoder. In other words. If I resize the player (custom pod) the video will remain same size, for exp. 640×360. I wonder how this plays out on different size screens. Is there a way that I could let the custom pod scale the video? so that it nicely fits the pod on every screen. I made the decision not to allow sizing as this would affect the quality of the video. I may make this an option in a new release. The up side would be additional control the downside could be pixelation. I agree with you on that.. But if my video is to big for someone’s screen. It will just crop it. I don’t think that’s such an elegant solution. That is true. But for most screens where you will serve this video I think bandwidth would be an issue for resolution of video larger than someones screen. I am thinking about adding away to scale just because it bugs me as well but it will be later. I just got your custom pod working and it works like a charm. I would really like it if the video would fit the entire pod. Right now it has a grey border around it. I think it would look a lot cleaner if it didn’t have that. Another thing what would be nice is if it would scale the video. That way it will always fit the player no matter what size screen you have. Right now it doesn’t do that. Appart from those two things I think it’s great. I was looking for a way to get better quality video in adobe connect and have the ability to use better hardware like a blackmagic capture card in combination with hd camera’s. Of course I can go for Talking stick but they’re really unclear about their pricing and it seemed like an unnecessary step in between. You pod solves this. Thanks a lot! I will be testing it again soon. ooh yeah what’s also not so nice is that it’s always called fmsplayer.zip. of course I can rename it, but it will always have the .zip as extension. hey nick, great pod thank you. one question, do you plan to integrate http stream to distribute videos also on iPad or iPhone with adobe connect app? if so, bye when do you think. Maybe, not anytime soon but I am considering it. When I click on the Register button, it takes me to a registration page, and once I register there, I get taken to a connect meeting with the message, “This is a private meeting. Your request to enter has been sent to the host. Please wait for a response.” Am I in the right place? You will have to close all of your browsers and try again. I think that you have a session established on a different Connect server. i setup a flash media encoder on one pc and the free flash media server on another , i started encoder on the second pc and connect it to a server , everythings is perfect , on both pc i started adobeconnect as a host and on the second as a relator and i can see the video feed. can you explain and help me? i have tried now with the third pc to connect it to another internet connection (so is not on the same lan) and now the fmsplayer show me black bullet so no connection and no video….in my understanding this can confirm that your fmsplayer neeeds to take video feed directly from the fms server and not directly from adobeconnect hosted server..
Once you are encoding and sending video from the encoder to FMS and have a Connect meeting room created and the custom pod in the meeting room. You will need to add the connection in the custom pod to the fms server. 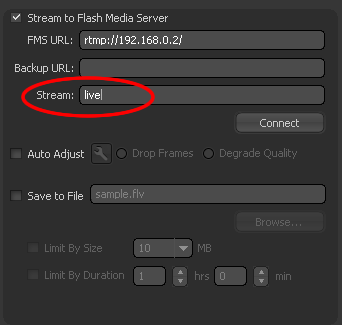 Make sure that the stream name in the custom pod matches the stream name from the live media encoder. After everything is setup and you have a couple of attendees in your room (for the test) click the Connect button in the custom pod. That should work. maybe i don’t explain well…what you told me is exactly what i have done…but my goal will be using fmsplayer to increase the video quality but using adobe server bandwidth as normally i do with default video pod inside adobeconnect because i have hosted plan service. what i have discover is each attendees in the room connect to my internal flash media server , use my bandwidth and because i’m using free flash media server i’m limited to 5 users i think…. that’s why when i use external connection i’m not able to view the video feed. can you confirm that by design fmsplayer works as explained or there is something i’m missed? Hi Nick, really appreciate your work here. If you are accepting contributions to help finance the adding of scaling to the pod I would happily do so, just let me know how, cheers! I added the ability to scale along with a couple of other features. It has not had a lot of testing so please let me know if it works. Hi there, is this still supported? Can I still use that custome pod? I am desperately looking for a dramatic increase of the video quality in Adobe Connect. I have multible cameras connected to a Blackmagic Video Switcher and the output of that switcher is fed into a Decklink Studio 2 grabbing card. I am looking for 720p video at least. Can you recommend me a provider (in Europe, Germany would be perfect) who is offering to host an Adobe Flash Media Server? It looks like you could use Streamzilla. Hi Nick, I have FMS setup and ready to go on Amazon cloud and am very keen to try your video pod, but keep getting the response: “This is a private meeting. Your request to enter has been sent to the host. Please wait for a response.” Have cleared cache and tried different browsers – no luck. Any other suggestions so I can download the swf file? Looks like you were able to get in. Fixed, please ignore this. Logged out, rebooted and logged back in – now all good. Is this solution still supported? I can’t download your custom pod. Sorry I did not realize the link was not working, it should be working now.